I’ve got 10 minutes until my big interview with a member of a group that’s trying to demonize immigrants and radically alter government policy. My leads are solid, but they unravel into an unsightly tangle of loose ends. Oh, have I mentioned that I’m sneaking around inside a ventilation system? And that if I get caught, my interview subject will probably be pissed? I am, as they say, in a bit of a pickle. The Occupation, out now on PC, PS4, and Xbox One, is at its best in these tense-as-all-get-out moments. 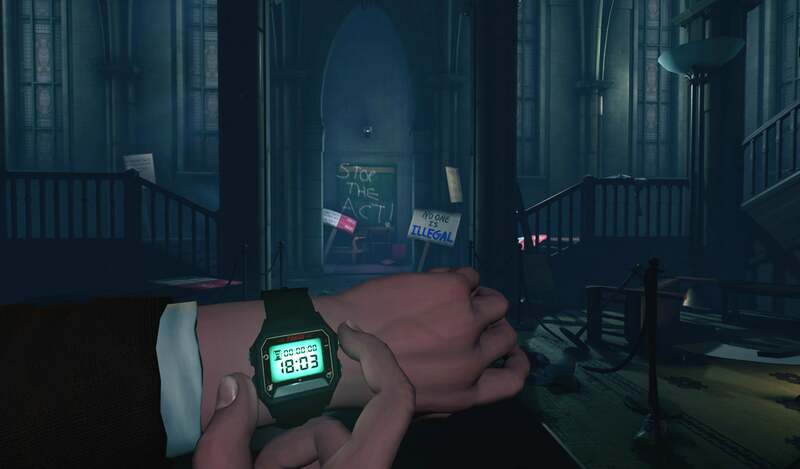 It’s a game in which you play as a journalist amidst the backdrop of a fictional 1987 terrorist attack in Britain that’s stoked the fires of anti-immigrant sentiment. You’re investigating the immigrant-banning efforts of a fictional government-adjacent entity called the Bowman Carson group. The goal is to write a report that’ll blow the doors off this whole thing, as we say in the business (we don’t actually say that; nobody says that). In truth, The Occupation’s take on journalism is more of a narrative framing than anything. Functionally speaking, you are a detective. The twist: The scene of the crime is still in motion. 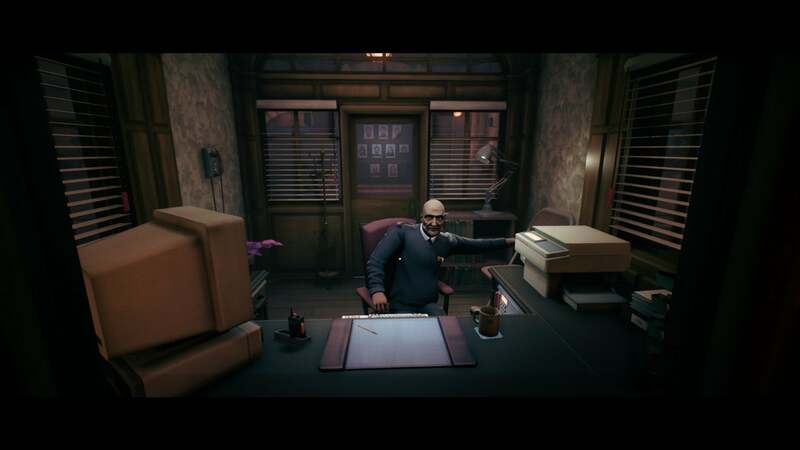 In each of the game’s three main segments, employees — office drones, security guards, janitors, and more, each with their own names, personalities, and priorities — are going about their daily routines, and you’ve got to sneak around without getting caught. Also, you’ve only got so much time before your interview, usually one hour. In that time, you’ve got to collect all the information you can. 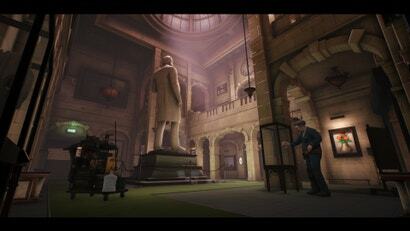 Under most circumstances, I’d say that a time limit clashes severely with hyper-detailed, immersive sim levels — places I want to explore at my own pace. But here, it mostly works. In games like Deus Ex and Dishonored, I’m a meticulous explorer, slipping into every vent, reading every document, and uncovering every conspiracy. The Occupation draws those instincts out and then traps them in a frantic time cage. Which leads will I prioritise? Which of my explorative tangents actually matters? The game drives this central tension home by making all of your actions deeply physical. Wanna read a letter that’s been crumpled up and thrown in the trash? First you’ve got to pick it up, then you’ve got to grab onto it, then you’ve got to pull it open. Cracking a safe? First enter the code, then wait for a time release valve to go off, then turn the dial, then twist the handle, then open the door. Some of these interactions are frustratingly un-intuitive, requiring sequences of mouse clicks and keyboard presses that never entirely, well, click. But these tactile moments make the world feel more real and turn your gentle rivulets of sweat into bullet waterfalls when you’ve got, say, 10 minutes until the big interview and you’re physically checking your in-game watch every 30 seconds. Time also counts in that you’ve got a plethora of options in each level, some of which open up depending on what characters are doing. Sure, you could sneak through vents and deactivate the power to get into a high-ranking detective’s office, or you could wait for the cleaning staff to unlock the door at the same time they do every day. Of course, then you’ll have to sneak around the janitor while investigating. Each action you take has consequences, which are compounded by the fact that you can’t do everything. This is The Occupation’s greatest strength, but the execution is at times frustrating. There is, for example, no manual save option — just auto-saves at the end of each level. This means you can’t just rewind your mistakes — which would take a lot of impact out of the whole time limit conceit — but you’ve really got to commit to play sessions. On top of that, you can’t replay levels without starting the whole game over. This was an especially big bummer for me after I finished the first major area. I only managed to follow two leads to their conclusions, and one barely even seemed to make an impact when I brought it up during the subsequent interview. My character stumbled through large portions of a conversation with the Bowman Carson group’s head of PR, and I came away feeling unsatisfied. But I also found myself immediately thinking of new ways to explore, new angles I hadn’t tried. I wanted to jump back into the level while all those thoughts were still fresh, but I couldn’t. I had to carry on with the game’s story irreparably impacted. It took me until the second proper level (about two hours into the game) to feel like I wasn’t completely lost, flailing about for any sign of a lead. The Occupation can be overwhelming, and not always in a good way. The densely packed story unspools itself both as you explore and through a series of sometimes-confusing vignettes. It’s easy to feel disoriented as you try to piece together a complete picture of what’s happening, making it difficult to care about the stakes of an otherwise timely tale. It also heads in some questionable directions, which make it kludgier than it needs to be. Fortunately, The Occupation is relatively short, inviting replays. Unfortunately, it’s relatively buggy, inviting even more frustration. While I’ve seen some players cite game-breaking bugs that cost them hours of progress, nothing like that has happened to me in my time with the game’s PC version. I did, however, get caught by a guard who literally warped into a room the moment he heard me. That was awkward. A general lack of polish permeates the experience, which is less than ideal in a game with this many constantly moving parts. 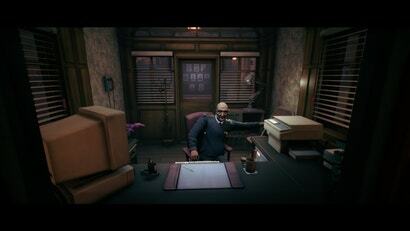 But the game is very good at making individual characters and moments compelling. Even when details you uncover don’t corroborate leads, they’re often charming bits of character-building for opinionated janitors, security guards who really just want to be actors, and passive-aggressive office workers. The Occupation’s levels have made me feel angry and even disheartened, but I want to go back to them. I want to turn these clockwork masterpieces upside-down and shake them until every last crumb falls out. That, in my book, is the signature of a special game—one whose rough edges I’m more than willing to put up with.